On 19 January 1785, aged 30 years old, Richard Crosbie flew a Hydrogen Air Balloon from Ranelagh Pleasure Gardens to Clontarf (on the Northside of the city), making him the first Irishman to complete a manned flight. His achievement was witnessed by a huge crowd of more than 35,000 people, and took place just 14 months after the first-ever manned balloon flight by the Montgolfier Brothers in France. His 'Aeronautic Chariot', or 'Grand Air Balloon and Flying Barge' (as he also called it), was made of wood covered with cloth, and was both designed and built by himself. It was magnificent to behold, being beautifully painted with emblematic figures of the wind and the arms of Ireland supported by Minerva and Mercury. Ever the showman, he himself was dressed in 'a robe of oiled silk, lined with white fur, his waistcoat and breeches in one, of white satin quilted, and Morocco boots, and a Montero cap of leopard skin', creating a suitably ostentatious appearance for such an auspicious occasion. Although he never achieved his ultimate ambition of crossing the channel, his achievement is commemorated by a statue of him in Ranelagh Park (what remains of the original Ranelagh Pleasure Gardens). Terrry Conaughton (Ranelagh Arts Festival Creative Director) and Bryan McMahon (Historian) speaking about the 2010 Ranelagh Arts Festival Balloon Launch from Ranelagh Gardens on 23 Jan 2010 to commemorate the 225th anniversary of Richard Crosbie's Balloon Flight. 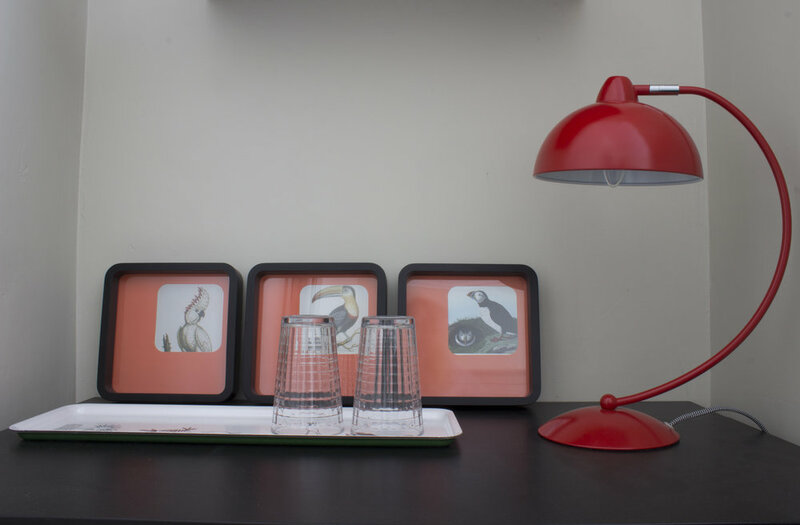 Named after Richard Crosbie (who famously undertook Ireland's first manned flight (in a hot air balloon) from Ranelagh Pleasure Gardens), The Richard Crosbie Room is a stylishly appointed Double Bedroom located on the Ground Floor at the front of the building. It is bright and airy with a large window looking out onto Ranelagh Road, and has an En Suite Shower Room. The comfortable King Size Bed is made up with luxurious 100% cotton, 400 thread count Hotel Quality Bed Linen, and there is a comfortable arm chair to relax in. The Workstation is equipped with a USB Charging Port, and there is FREE Wifi to ensure that you can stay connected whilst you are away from home. 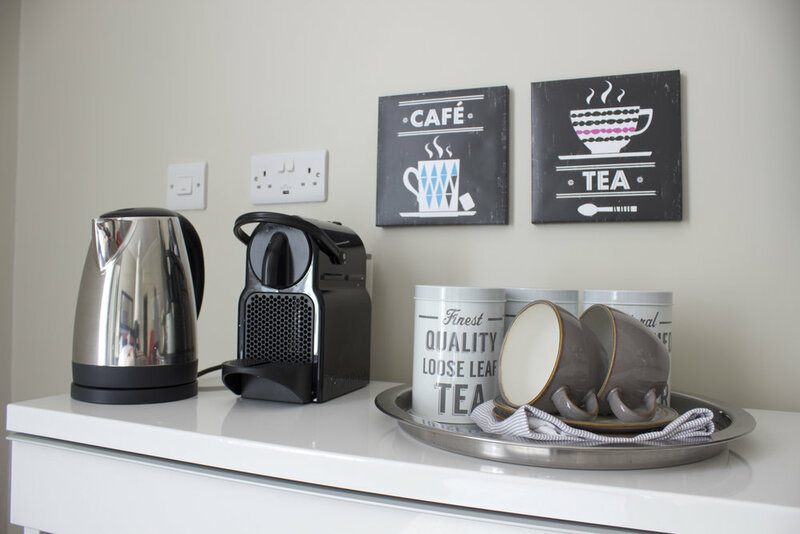 The Room features a Flat Screen Television with a selection of Irish and UK TV Channels to keep you entertained, as well as a Tea Station with Mini Fridge, Kettle and Nespresso Machine. The tastefully decorated En Suite Shower Room has a Shower, WC and Wash Hand Basin. To make sure you enjoy a warm Irish welcome, you'll find a selection of the very best Irish products to welcome you when you arrive - bottles of Ballygowan Water on your beside table, a Butler's Irish Chocolate on each pillow, The Handmade Soap Company's natural products in the bathroom, as well as a selection of Nespresso Pods and Gourmet Irish Teas in the Tea and Coffee Station. (Please note that there are no cooking facilities - but there ARE lots of fantastic restaurants and coffee shops nearby. Check out some of our favourite place to eat here).